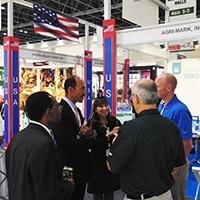 Six member companies exhibited in the USDEC booth at the 2014 Gulfood Show in Dubai in February. U.S. cheeses, whey products, milk powders and butter were showcased to buyers and end-users from the Middle East/North Africa region. Suppliers also participated in the Emirates Salon Culinaire, a competition, during which professional chefs, pastry chefs, cooks and bakers competed in 25 classes that USDEC sponsored to familiarize young chefs with U.S. cheese.